Warning: This article contains images that readers might find disturbing. Rosa María Apodaca has spent the past six years looking for her eldest daughter. Patricia Jazmín Ibarra was 18 when she left on the morning of 7 June 2011 to go to work at a mobile phone shop in the centre of Ciudad Juárez. "They stole her," says her mother, who has given up her job to look for Patricia Jazmín. 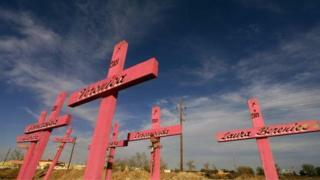 Ms Apodaca knows that many of the young girls who disappeared from Ciudad Juárez were eventually found dead. The city on the Mexican-US border is located on a key route for drug smuggling and human trafficking. In the 1990s, Ciudad Juárez became infamous for the staggering numbers of young women who disappeared from it, and between 2008 and 2011 the city held the dubious title of murder capital of the world. "They never find them alive. They find only bones, this is how they give them back to their families," Ms Apodaca says of the many women who have gone missing. "You never have the certainty that it is your own daughter." It is people like Ms Apodaca that Dr Alejandro Hernández Cárdenas is trying to help. He works as a forensic doctor at the prosecutor's office and has developed a special technique to rehydrate corpses in order to help identify them. The technique is so innovative that last year the Mexican Institute for Industrial Property gave him a patent for his secret formula. Forensic experts have used glycerine injections to reconstitute fingers to get prints for over a century. But that technique does not work for entire bodies. DNA testing can help, but in order to identify bodies, samples from two direct family members are needed for comparison. With the rehydration process, the body can regain most of its original condition so families can identify it. "I think I am doing this work because I was affected by the idea of these bodies going to mass graves or their families not being able to mourn properly," Dr Hernández says. The rehydration technique has also helped provide key leads in criminal investigations. When Dr Hernández rehydrated a corpse in the state of Queretaro, in central Mexico, he discovered unusual lesions on its skin, which later led to an arrest being made. The doctor was told that his help was key in bringing the murderer to justice. Dr Hernández, 59, says that he first thought of becoming a forensic expert when he was 18 and studying to be a dentist while also driving an ambulance to help provide for his young family. One night in 1977, he was called out to a train accident that had killed 35 people and had left most of the victims unrecognisable. "When the forensic doctor arrived, he told us to check their teeth," Dr Hernández recalls. He helped out at the morgue for four or five days, while the victims' families were waiting for news outside. While the task may seem gruesome to some, it inspired in Dr Hernández a desire to help identify victims of crime. After becoming a dentist and eventually joining the forensic lab, he started experimenting with his rehydration technique. He used pig skin and human fingers he kept in glass jars and checked on them daily. One day in 2004 he was inspecting seven jars. When he took out the finger from the fourth jar, it looked perfect. "It was like a new finger. I couldn't believe it," he says. At first he thought it was too good to be true and suspected his colleagues of playing a trick on him. But when he confronted them, one told him: "We don't mess with them, they smell too bad." He had found the magic formula and four years later managed to rehydrate a full corpse. In recent years, Dr Hernández has been applying his technique more and more to migrants found dead in the border area. Ciudad Juárez is one of the main crossing points to the US. More than 6,000 bodies have been recovered from along the border since the 1990s. The bodies are often found in mass graves and are often hard to identify because they have been mutilated or are mummified because of the harsh weather conditions. Because there is no investigation unit at the forensic lab where he works, Dr Hernández has been financing his research himself, paying for the chemicals and working on it in his spare time. He hopes that someone will take an interest in his research but ultimately wishes for less, rather than more, work. "It's not that I am lazy, it's just that when I have a lot of work it means that a lot of people have died," he explains. "I would prefer not to have found this formula - if it meant that those people had never died." Irene Caselli was in Ciudad Juárez as an Adelante Latin America Reporting Fellow with the International Women's Media Foundation.